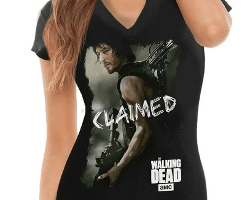 If you are looking for a birthday or Christmas present for a Walking Dead fan then we can provide you with a variety of officially licensed merchandise from the post-apocalyptic AMC series. 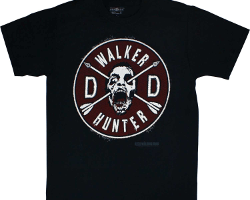 For instance, one of our most popular Walking Dead T-Shirts is a blood-stained black T-Shirt featuring The Walking Dead logo emblazoned on the front that is being clawed at by dozens of hungry Walker hands! 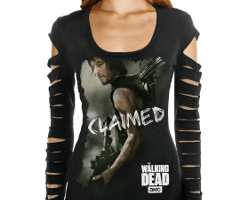 Fans of Daryl Dixon will love our Walking Dead ‘Claimed’ T-Shirts which feature everyone’s favourite cross-bow wielding zombie hunter. These high quality cotton shirts are available to order in both short sleeved and laser slashed long sleeved versions to suit all seasons and style preferences. 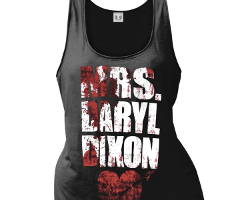 Just can’t get enough of Daryl Dixon? Not to worry; our Zombie Pit For Juniors Merchandise Section also includes a ‘Mrs Daryl Dixon’ black T-Shirt complete with a red heart shot through with one of Daryl’s crossbow arrows, as well as a Daryl Dixon ‘Walker and Wings’ T-Shirt that sports a Walker which has been slain by Daryl’s crossbow arrows on the front and his iconic angel wings emblazoned in white and red on the back. 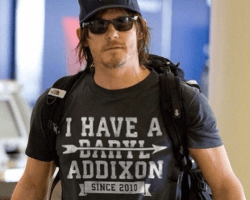 If you are a die-hard Daryl Dixon fan then we can even match you with an epic ‘I Have A Daryl Ad-Dixon’ T-Shirt; a design which has actually been worn by Norman Reedus himself! In addition to stocking up on stylish Walking Dead T-Shirts, why not add the finishing touch to your post-apocalyptic wardrobe with a set of super soft Walking Dead zombie socks? Made from super stretchy polyester, these soft yet stylish socks will ensure you can keep pace whilst running away from rampaging Walkers. 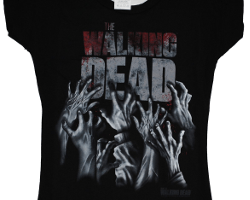 As well as Walking Dead T-Shirts and socks, our Zombie Pit Clothes For Juniors Merchandise Section also includes a wide range of PJs and leggings. 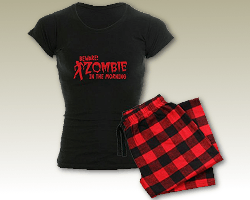 Our ‘Run like zombies are coming’ PJs with tartan bottoms are the perfect attire for a zombie-themed movie marathon and will ensure that even if so that if you are woken from slumber by the initial zombie outbreak that you can jump into action and look stylish whilst doing so! Alternatively, by investing in a pair of our graphic print leggings you can add a living dead edge to any outfit. Made from high quality polyester and spandex, these super stretchy zombie skeleton graphic print leggings will feel like a second skin and are ideal for a quick and easy zombie cosplay costume or Halloween outfit. 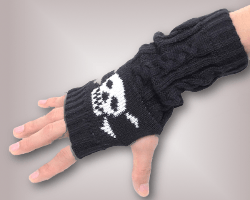 At Zombie Pit we will continue to add new listings to our Clothes For Juniors Merchandise Section every week so make sure you come back soon to check out our latest post-apocalyptic fashion trends!